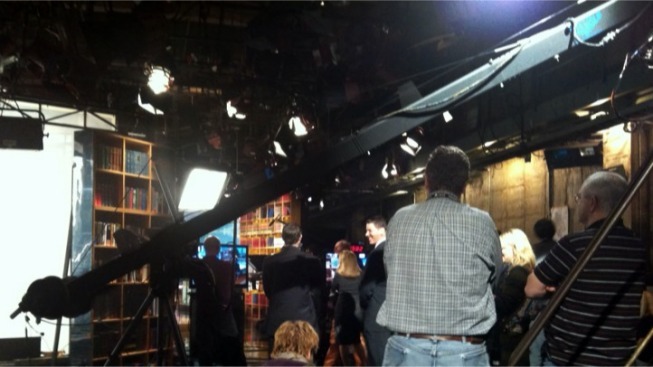 Julia Louis-Dreyfuss was shooting on the "Meet the Press" set Tuesday. UPDATE: Julia Louis-Dreyfus and company are shooting on the "Meet the Press" set at NBC Washington during Tuesday afternoon and evening. Also on set: Tony Hale, best known for playing Buster on "Arrested Development." Although we don't know anything about his new character, Hale is wearing a suit and tie with a satchel over his shoulder -- pretty standard D.C. work attire. "Veep," the upcoming HBO comedy series starring Julia Louis-Dreyfus, is shooting in the District Tuesday and Saturday, the District's Film Office writes in a press release. The show also filmed parts of its pilot in D.C. in March, but the production has been spending most of its time in Baltimore, thanks to a very generous package of tax breaks and credits from the state of Maryland. So where are they filming this week? According to the Film Office's site, on Tuesday, Oct. 25, they're scheduled to shoot on Constitution Avenue NW between 12th and 14th streets until 11 p.m.
On Saturday, Oct. 29, the show is doing driving shoots all around town -- including close to the vice president's Residence at Observatory Circle. The three D.C. officials also sat down with HBO to discuss the possibility of basing more of "Veep"'s filming in Washington. [Film Office spokesperson Leslie] Green says the face-to-face meeting greatly improved the likelihood of that happening, based on an HBO executive telling Gray and [Film Office head Crystal] Palmer that their visit "clearly shows D.C. is engaged more than ever in attracting production." Veep Is Filming in the District Today was originally published by Washington City Paper on Oct. 25, 2011.